But Android 7.0 Nougat is proving to be an exception to this rule, as it actually has a central theme: multitasking. 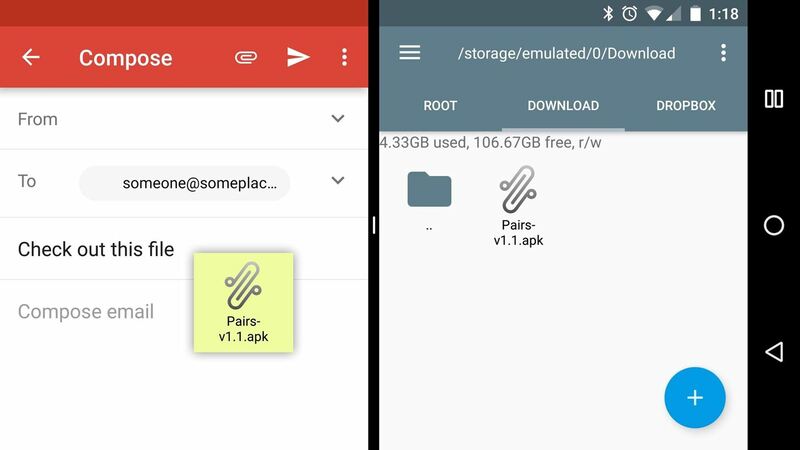 New features like a split-screen view, drag-and-drop functionality, and several nifty shortcuts make this a well-rounded release, and they all work together with the hopes of finally turning Android into a true multitasking platform. The central aspect to the new multitasking features is a split-screen mode that lets you view two apps side by side. This is a feature that Samsung and LG have added to their manufacturer skins in the past, but it's now officially a part of the main Android code base. 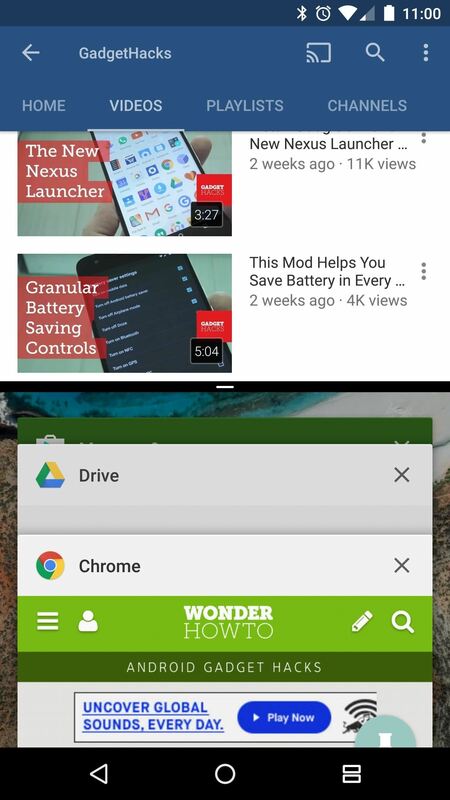 Google has been working on split-screen mode for a few versions now, but they wanted to make sure everything was as intuitive as possible before fully releasing the feature. They've definitely succeeded in this goal, because Nougat's split-screen interface is as straightforward as it gets. 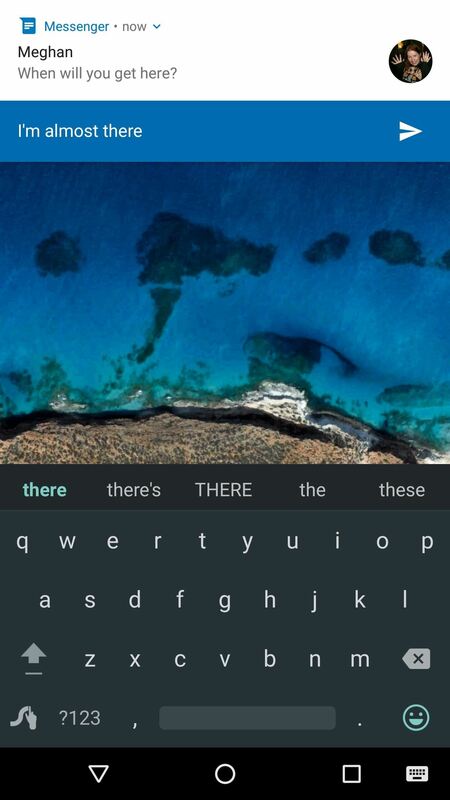 While you're using any app, simply long-press your recent apps button, then the foreground app will shrink down to only occupy the top half of your screen. In the void this creates, you'll see the rest of your recent apps list—just pick one, and it will occupy the other half of your screen. 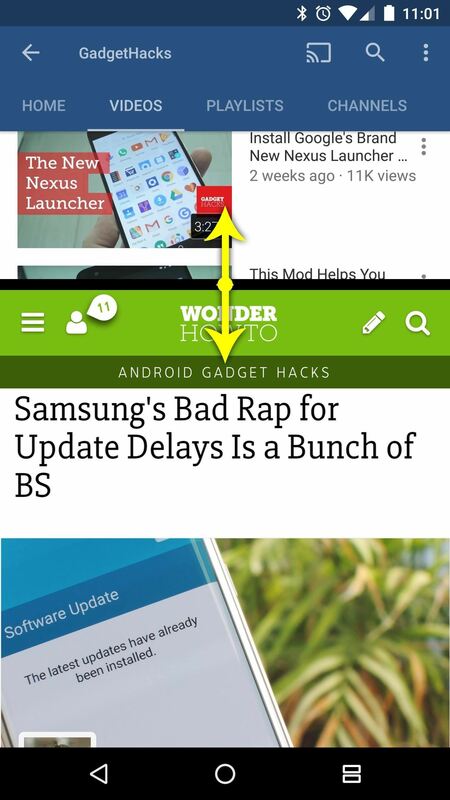 You can use the two apps simultaneously—scrolling through one, then tapping a link on the other, for instance. While you're doing so, you'll notice a black bar separating the two screens—just drag this in either direction, and the apps will automatically be resized to fit. Then, to exit split-screen mode, just long-press the recent apps button again. 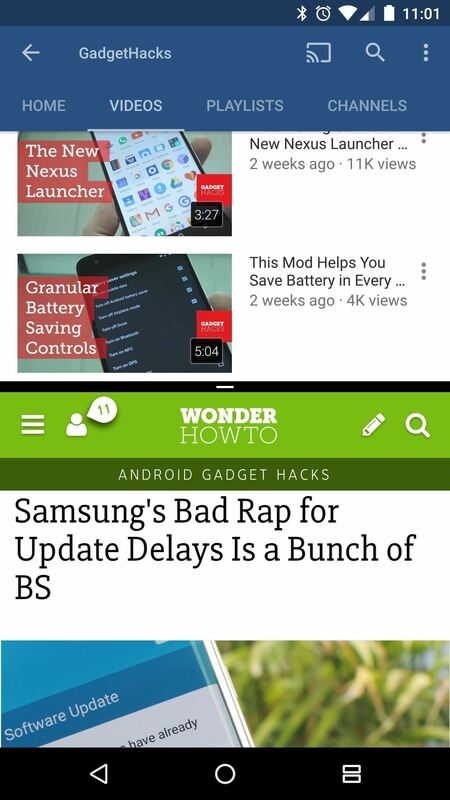 Alternatively, you can drag the divider between the two screens all the way to the top or bottom to make one of the apps take up the full screen again. This "resizable windows" feature was made possible by the fact that Android apps always come bundled with different DPI layouts to match the varying screen sizes offered by each device. This basically means that there are small, medium, and large layouts cooked into each app on your phone, which was a lot of extra work for app creators, but coincidentally provides an easy way for Android to resize split-screen content on the fly. So what was once viewed as a burden for Android developers has now become one of the operating system's biggest strengths. 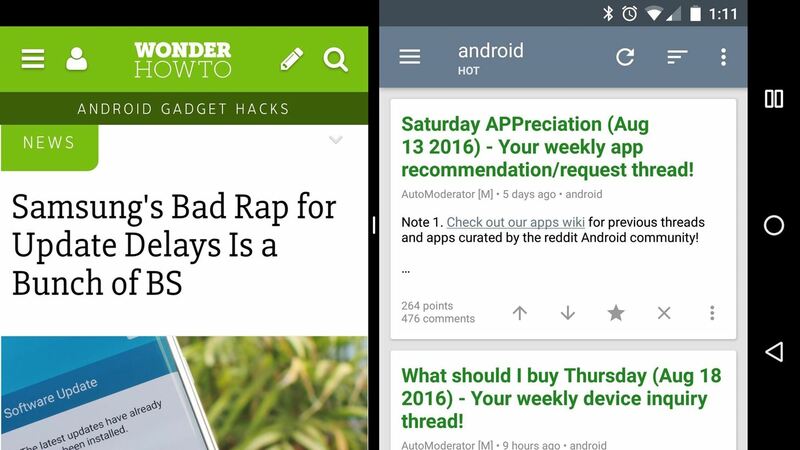 Split-screen mode certainly isn't the only multitasking improvement in Android Nougat. In fact, a recent update to the Gmail app demonstrates that "drag and drop" functionality is possible with any app on Android 7.0. Picture this: Instead of tapping the "Attach" button to add a file to your email, then digging through the various menus to find the PDF you want to add to your message, just open your favorite file browser in split-screen mode, then drag the file directly onto the Gmail app next to it. 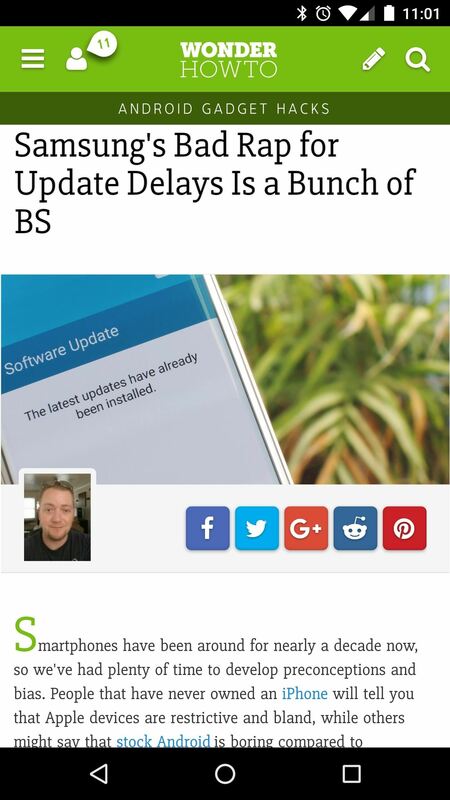 Developers would have to update their apps for you to get this functionality, but Android Nougat has already made it possible. Multitasking isn't just about using two apps side by side, as there are many times that you only need to take a quick peek at the last app you were using. With Android Nougat, this has become a lot easier—simply tap your recent apps button twice, then you'll instantly switch to the last app you were using. This works a lot like the Alt-Tab gesture in Windows (and Command-Tab on Macs), so you can keep tapping that button twice to flip back and forth between your two most recently-used apps. Keeping with the theme of getting things done faster with minimal interruptions, Google added a new "Direct Reply" feature to Nougat. When you get a new message, don't stop what you're doing—just tap the "Reply" button on the notification, then type out a response without leaving the app you're currently using. A few apps have had this functionality in the past, but Nougat provides a system-wide API for Direct Reply, which means that any app developer can implement this feature with minimal effort, and the interface will be consistent across all apps that use it. But the multitasking experience certainly isn't the only thing that has been improved in Android 7.0 Nougat. So if you'd like to see all of the coolest user-facing changes in Google's latest operating system, make sure to check out our full list.